If you want to live in an Apple world now you have to embrace the dongle life, there is just no avoiding it. Ridding the iPhone 7 of a headphone jack is either seen as user hostile or a move that took courage. Unfortunately the new MacBook Pro has a new problem. Adopting USB-C has been hailed as a future move, but when the world still revolves around USB-A what do you do. Well you buy a Rophie USB-C to USB-A Adaptor thats what. Disclaimer: Rophie sent me a two pack of these adaptors for the process of review, but had no control over the review process or verdict. Apple will sell you any number of dodges, adapt USB-C to anything you need it to be. 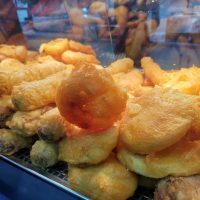 Unfortunately even at the prices they have slashed them to, it is going to cost you a fair chunk of money to cover everything. Why bother, when all you need is a simple pocked sided adaptor for a price anyone can afford. I have been trying to convince myself that this isn’t a dongle – it’s an adaptor. I’m in denial, trying to avoid the word dongle as much as I possibly can. Although lets be honest it’s just a mini dongle, and a well built one too. A build quality score is a strange thing to find in a review for what is essentially a very small bit of metal wrapped in plastic. With that said the device feels very well built for the small price you pay for two of them. The device fits snug into the MacBook ports, or indeed any USB-C device. Giving a reassuring click when you slide in a regular old USB-A cable. I have used it with my iPhone cable, USB drives and all sorts of peripherals with perfect results. I was dubious of what o expect given the very small price for two of them, but given the quality detailed above this gets a huge thumbs of for Value. It’s a pain that users are in a position that they need one of these adaptors – but you can’t go far wrong for such a small outlay. If you have a new MacBook Pro, or a 12” MacBook you need a couple of these in your dongle life. They also come in handy of you have a USB-C equipped phone, so there really isn’t an excuse not to buy them. You can pick a two pack up on Amazon for £5.29. If you want to live in an Apple world now you have to embrace the dongle life, there is just no avoiding it. Ridding the iPhone 7 of a headphone jack is either seen as user hostile or a move that took courage. Unfortunately the new MacBook Pro has a new problem. Adopting USB-C has been hailed as a future move, but when the world still revolves around USB-A what do you do. Well you buy a Rophie USB-C to USB-A Adaptor thats what. Disclaimer: Rophie sent me a two pack of these adaptors for the process of review, but had no control over the review process or verdict. 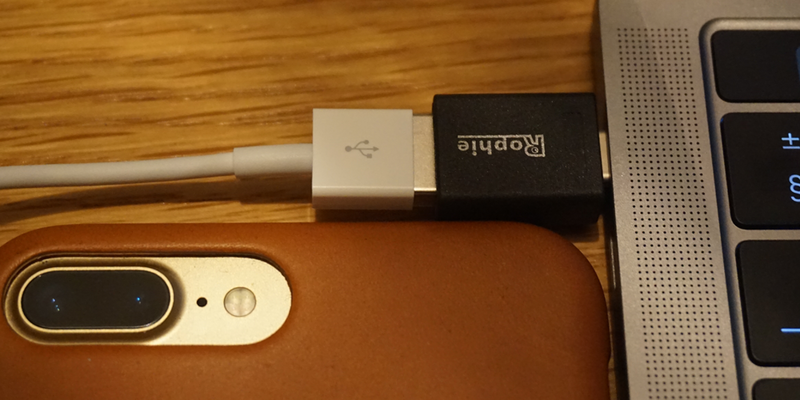 Apple will sell you any number of dodges, adapt USB-C to anything you need it to be. Unfortunately even at the prices they have slashed them to, it is going to cost you a fair chunk of money to cover everything. Why bother, when all you need is a simple pocked sided adaptor for a price anyone can afford. Build Quality And Usage I have been trying to convince myself that this isn’t a dongle - it’s an adaptor. I’m in denial, trying to avoid the word dongle as much as I possibly can. Although lets be honest it’s just a mini dongle, and a well built one too. A build quality score is a strange thing to find in a review for what is essentially a very small bit of metal wrapped in plastic. With that said the device feels very well built for the small price you pay for two of them. The device fits snug into the MacBook ports, or indeed any USB-C device. Giving a reassuring click when you slide in a regular old USB-A cable. I have used it with my iPhone cable, USB drives and all sorts of peripherals with perfect results. Value I was dubious of what o expect given the very small price for two of them, but given the quality detailed above this gets a huge thumbs of for Value. It’s a pain that users are in a position that they need one of these adaptors - but you can’t go far wrong for such a small outlay. 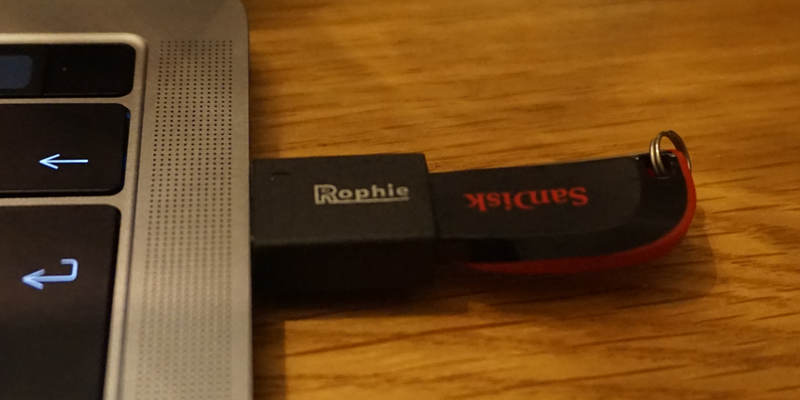 Rophie USB-C to USB-A Adaptor Verdict If you have a new MacBook Pro, or a 12” MacBook you need a couple of these in your dongle life. They also come in handy of you have a USB-C equipped phone, so there really isn’t an excuse not to buy them. You can pick a two pack up on Amazon for £5.29. If you have a new MacBook Pro, or a 12” MacBook you need a couple of these in your dongle life.